Schematic drawing illustrating clathrin-mediated (left) and clathrin-independent endocytosis (right) of synaptic vesicle membranes. Endocytosis pathways can be subdivided into four categories: namely, clathrin-mediated endocytosis, caveolae, macropinocytosis, and phagocytosis. Clathrin-mediated endocytosis is mediated by small (approx. 100 nm in diameter) vesicles that have a morphologically characteristic coat made up of a complex of proteins that are mainly associated with the cytosolic protein clathrin. Clathrin-coated vesicles (CCVs) are found in virtually all cells and form domains of the plasma membrane termed clathrin-coated pits. Coated pits can concentrate large extracellular molecules that have different receptors responsible for the receptor-mediated endocytosis of ligands, e.g. low density lipoprotein, transferrin, growth factors, antibodies and many others. Caveolae are the most common reported non-clathrin-coated plasma membrane buds, which exist on the surface of many, but not all cell types. They consist of the cholesterol-binding protein caveolin (Vip21) with a bilayer enriched in cholesterol and glycolipids. Caveolae are small (approx. 50 nm in diameter) flask-shape pits in the membrane that resemble the shape of a cave (hence the name caveolae). They can constitute up to a third of the plasma membrane area of the cells of some tissues, being especially abundant in smooth muscle, type I pneumocytes, fibroblasts, adipocytes, and endothelial cells. Uptake of extracellular molecules is also believed to be specifically mediated via receptors in caveolae. Macropinocytosis, which usually occurs from highly ruffled regions of the plasma membrane, is the invagination of the cell membrane to form a pocket, which then pinches off into the cell to form a vesicle (0.5–5 µm in diameter) filled with a large volume of extracellular fluid and molecules within it (equivalent to ~100 CCVs). The filling of the pocket occurs in a non-specific manner. The vesicle then travels into the cytosol and fuses with other vesicles such as endosomes and lysosomes. apoptotic cells, which only occurs in specialized cells. These processes involve the uptake of larger membrane areas than clathrin-mediated endocytosis and caveolae pathway. More recent experiments have suggested that these morphological descriptions of endocytic events may be inadequate, and a more appropriate method of classification may be based upon the clathrin-dependence of particular pathways, with multiple subtypes of clathrin-dependent and clathrin-independent endocytosis. Mechanistic insight into non-phagocytic, clathrin-independent endocytosis has been lacking, but a recent study has shown how Graf1 regulates a highly prevalent clathrin-independent endocytic pathway known as the CLIC/GEEC pathway. Early receptors in the acid pH of the lumen, and from which many of the receptors recycle to the cell surface (via tubules). It is also the site of sorting into transcytotic pathway to late components (via vesicular component, which can form multivesicular bodies (MVB) or endosomal carrier vesicles (ECVs)). Late endosomes receive internalized material en route to lysosomes, usually from early endosomes in the endocytic pathway, from trans-Golgi network (TGN) in the biosynthetic pathway, and from phagosomes in the phagocytic pathway. Late endosomes often contain many membrane vesicles or membrane lamellae and proteins characteristic of lysosomes, including lysosomal membrane glycoproteins and acid hydrolases. They are acidic (approx. pH 5.5), and are part of the trafficking itinerary of mannose-6-phosphate receptors. Late endosomes are thought to mediate a final set of sorting events prior to delivery of material to lysosomes. Lysosomes are the last compartment of the endocytic pathway. They are acidic (approx. pH 4.8) and by EM usually appear as large vacuoles (1-2 µm in diameter) containing electron dense material. They have a high content of lysosomal membrane proteins and active lysosomal hydrolases, but no mannose-6-phosphate receptor. They are generally regarded as the principal hydrolytic compartment of the cell. Lysosomes' chief function is to break down cellular waste products, fats, carbohydrates, proteins, and other macromolecules into simple compounds. 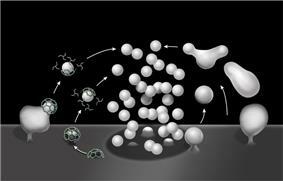 These are then returned to the cytoplasm as new cell-building materials. To accomplish this, lysosomes use some 40 different types of hydrolytic enzymes, all of which are manufactured in the endoplasmic reticulum and modified in the Golgi apparatus. It was recently found that an eisosome serves as a portal of endocytosis in yeast. The major route for endocytosis in most cells, and the best-understood, is that mediated by the molecule clathrin. This large protein assists in the formation of a coated pit on the inner surface of the plasma membrane of the cell. This pit then buds into the cell to form a coated vesicle in the cytoplasm of the cell. In so doing, it brings into the cell not only a small area of the surface of the cell but also a small volume of fluid from outside the cell. Coats function to deform the donor membrane to produce a vesicle, and they also function in the selection of the vesicle cargo. Coat complexes that have been well characterized so far include coat protein-I (COP-I), COP-II, and clathrin. Clathrin coats are involved in two crucial transport steps: (i) receptor-mediated and fluid-phase endocytosis from the plasma membrane to early endosome and (ii) transport from the TGN to endosomes. In endocytosis, the clathrin coat is assembled on the cytoplasmic face of the plasma membrane, forming pits that invaginate to pinch off (scission) and become free CCVs. In cultured cells, the assembly of a CCV takes ~ 1min, and several hundred to a thousand or more can form every minute. The main scaffold component of clathrin coat is the 190-kD protein called clathrin heavy chain (CHC), which is associated with a 25- kD protein called clathrin light chain (CLC), forming three-legged trimers called triskelions. Vesicles selectively concentrate and exclude certain proteins during formation and are not representative of the membrane as a whole. AP2 adaptors are multisubunit complexes that perform this function at the plasma membrane. The best-understood receptors that are found concentrated in coated vesicles of mammalian cells are the LDL receptor (which removes LDL from circulating blood), the transferrin receptor (which brings ferric ions bound by transferrin into the cell) and certain hormone receptors (such as that for EGF). At any one moment, about 25% of the plasma membrane of a fibroblast is made up of coated pits. As a coated pit has a life of about a minute before it buds into the cell, a fibroblast takes up its surface by this route about once every 16 minutes. Coated vesicles formed from the plasma membrane have a diameter of about 36 nm and a lifetime measured in a few seconds. Once the coat has been shed, the remaining vesicle fuses with endosomes and proceeds down the endocytic pathway. The actual budding-in process, whereby a pit is converted to a vesicle, is carried out by clathrin assisted by a set of cytoplasmic proteins, which includes dynamin and adaptors such as adaptin. Coated pits and vesicles were first seen in thin sections of tissue in the electron microscope by Matt Lions and Parker George. The importance of them for the clearance of LDL from blood was discovered by R. G Anderson, Michael S. Brown and Joseph L. Goldstein in 1976. Coated vesicles were first purified by Barbara Pearse, who discovered the clathrin coat molecule. ^ Marsh, M.; McMahon, HT (July 1999). "The Structural Era of Endocytosis". Science 285 (5425): 215–20. ^ a b Marsh, Mark (2001). Endocytosis. Oxford University Press. p. vii. ^ Parton RG, Simons K (March 2007). "The multiple faces of caveolae". Nature Reviews Molecular Cell Biology 8 (3): 185–94. ^ Falcone S, Cocucci E, Podini P, Kirchhausen T, Clementi E, Meldolesi J (November 2006). "Macropinocytosis: regulated coordination of endocytic and exocytic membrane traffic events". Journal of Cell Science 119 (Pt 22): 4758–69. ^ Lundmark R, Doherty GJ, Howes MT, et al. (November 2008). "The GTPase-Activating Protein GRAF1 Regulates the CLIC/GEEC Endocytic Pathway". Current Biology : CB 18 (22): 1802–8. ^ Mellman I (1996). "Endocytosis and molecular sorting". Annual Review of Cell and Developmental Biology 12: 575–625. ^ Mukherjee S, Ghosh RN, Maxfield FR (July 1997). "Endocytosis". Physiological Reviews 77 (3): 759–803. ^ Stoorvogel W, Strous GJ, Geuze HJ, Oorschot V, Schwartz AL (May 1991). "Late endosomes derive from early endosomes by maturation". Cell 65 (3): 417–27. ^ Gruenberg J, Maxfield FR (August 1995). "Membrane transport in the endocytic pathway". Current Opinion in Cell Biology 7 (4): 552–63. ^ Luzio JP, Rous BA, Bright NA, Pryor PR, Mullock BM, Piper RC (May 1, 2000). "Lysosome-endosome fusion and lysosome biogenesis". Journal of Cell Science 113 (9): 1515–24. ^ Walther TC, Brickner JH, Aguilar PS, Bernales S, Pantoja C, Walter P (February 2006). "Eisosomes mark static sites of endocytosis". Nature 439 (7079): 998–1003. ^ Benmerah A, Lamaze C (August 2007). "Clathrin-coated pits: vive la différence?". Traffic (Copenhagen, Denmark) 8 (8): 970–82. ^ Rappoport JZ (June 2008). "Focusing on clathrin-mediated endocytosis". The Biochemical Journal 412 (3): 415–23. ^ Granseth B, Odermatt B, Royle SJ, Lagnado L (December 2007). "Clathrin-mediated endocytosis: the physiological mechanism of vesicle retrieval at hippocampal synapses". The Journal of Physiology 585 (Pt 3): 681–6. ^ Robinson MS (March 1997). "Coats and vesicle budding". Trends in Cell Biology 7 (3): 99–102. ^ Glick BS, Malhotra V (December 1998). "The curious status of the Golgi apparatus". Cell 95 (7): 883–9. ^ Gaidarov I, Santini F, Warren RA, Keen JH (May 1999). "Spatial control of coated-pit dynamics in living cells". Nature Cell Biology 1 (1): 1–7.